What a difference a year makes. For the first time I can remember since joining my first church staff in 2004, I enjoyed the month of December. There were definitely some enjoyable moments scattered across the years, but as the years went on December was not something I looked forward to. I don’t know exactly what it was because I loved my staff jobs, but Decembers on staff never seemed to fit in the rhythm of the rest of the year for me. December can be a challenging month for church staff with the added bonus of Christmas extravaganzas. I’ve referred to this in the past as the “Christmas Loudness Wars” because it often seems like every year needs to be bigger or louder than the year before. Decembers at North Point were about as good as it can get working on a church staff, but I’d be lying if I said they still didn’t take a toll on me over the years. After December 2014 I wondered if I would ever want to mix in the month of December again, but I’m so glad I didn’t follow through on that. Fast forward to December 2015 and what a difference a year can make. It felt like a reward for the Decembers of the last decade of my life. I spent a good portion of the month in South Florida mixing FOH at Christ Fellowship’s Royal Palm campus, and I had a blast. I can’t remember the last time I enjoyed being a part of Christmas services this much, but it was probably when I was serving as a musician. 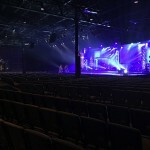 My stint at CF began the first week in December mixing a weekend service. This helped me a ton because it gave me time in the room I’d be working in for Christmas services along with an idea of how they’re used to doing things. 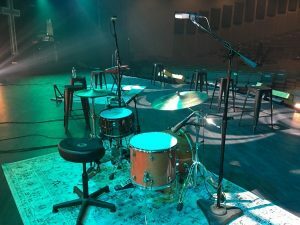 One of the interesting things for me as a freelance engineer is seeing how differently everyone prepares for their services from setup to soundchecks to final rehearsals. Getting in a couple weeks early gave me a good idea of the workflow everyone was used to so I could go with the flow as much as possible. The console at my disposal was a familiar friend in the Avid Profile. 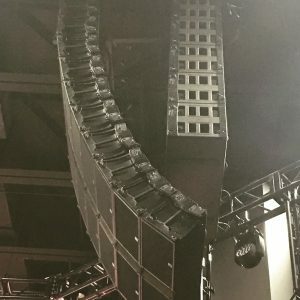 The PA was L-Acoustics ARC’s with SB28’s on the ground, so I was pretty excited about it. As expected, the PA sounded really good, and I just did a little bit of EQ on my master output to get it a little closer to what I’m used to purely for personal tastes. One of the challenges I faced was monitors were fed from FOH. I don’t think this is ever ideal, but fortunately CF’s setup was one of the better solutions I’ve seen for this. I was responsible for the worship leader’s mix along with a sub-mix of drums while the rest of monitors were handled by the band using Avioms on stage. Aviom feeds were created with a mix of aux sends and band inputs duplicated to a 2nd set of channels I kept on the bottom layer of the desk. This meant I had dedicated channels for the FOH mix and dedicated channels for monitors so FOH mix decisions didn’t impact the band’s monitors. I just had to be conscious of getting my gain settings right up front because it was shared between the two. My real challenge from this came because the console needed to run in variable groups mode to accommodate all the feeds happening via the aux sends. Mixing in churches is often the art of squeezing a bunch of watermelons into a garden hose, and I find the process easier to manage and perform when you have extra hoses available in the form of groups. If the Christmas band had just been a couple guitars and keyboards, it wouldn’t have been much of a challenge, but for Christmas I had an additional 4 piece string section along with a 4 piece horn section. Typically I would manage those additions with some group processing, but I had to get creative this time because variable groups mode limited me to 4 stereo groups. Two went to the drums for parallel compression, one went to the vocals, and the final one handled the rest of the instrumentation. I love mixing horns, and I knew I’d want to push them at times to punch up their parts so I needed some kind of solution for them. I was out of groups and VCA’s so I sent the horns post-fader to a stereo aux send which fed into a compressor to give them some overall leveling and glue. Then I returned that compressor to a stereo channel I used to ride the horn section. This, in effect, gave me an additional group to manage the horns with. The strings were a little different, though, because strings with a rock band have proven tricky for me. On the one hand microphone bleed from backline can be a big issue, but I think the bigger issue with strings usually comes down to monitors. 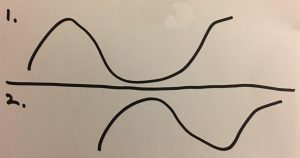 I’ve mixed string players in the past who performed exquisitely right up until the full band kicked in sending their pitch and tone all over the map. 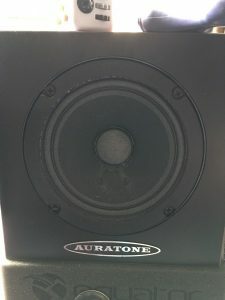 I don’t think many string players get a lot of experience playing with rock bands on stage and consequently aren’t used to working with monitors. If I ever sound like a broken record on the value of great monitor setups and mixes, it’s because they literally will make or break a performance. In this case, I knew the players were good, but I also knew the strings’ monitor situation wasn’t ideal. I had great string tracks available so I relied primarily on those blended with a bit of the real strings to help keep things real. In the few portions of the service where I depended on the live strings, I just multi-selected their inputs and rode them up. Another area needing strategic care was DSP allocation. There was some intense processing already happening on the console that I couldn’t remove so I knew I couldn’t wantonly just start throwing plug-ins on things. This was ultimately a non-issue, though, because I’ve been moving my workflow in a different direction over the last six months as I’ve transitioned out of working in the same room every week. These days I try and do as much processing directly on the console first before resorting to any sort of outboard whether hardware or plug-in based. I started this partly due to resource limitations in new environments, but I also started this because I don’t think any of the console manufacturers handle plug-in integration as elegantly as the VENUE platform, and I’ve used more non-VENUE’s over the last six months than VENUE’s. Love it or hate it, from a workflow standpoint using desk processing is often faster and sometimes that makes a bigger difference than the sonic benefits of better processors. Part of this change also came from a desire to simplify things which, again, harkens back to workflow speed. The reality is the heart and soul of my mixes comes from me and not the gear. There are things I can do and places I can take a mix that are gear dependent, but it’s not the end-all be-all. So I did the bulk of processing with the desk and added my spices where I could. It’s really all about prioritizing things to make the largest impact on the mix. In this case, I knew I’d want things like Waves’ C6 and MaxxVolume available for vocals so I set those up first to make sure they had DSP allocated. Next came some drum and bass processing along with overall mix management/processing stuff like the API-2500 for master buss compression and a C4 to keep things tonally under control. With those processors running, I added additional things like some NLS and guitar stuff here and there. One thing I used a little more liberally than usual was Waves’ LoAir plug-in for sub-harmonic generation. With a handful of SB28’s at my disposal, I couldn’t resist sliding it in at times to up the emotion factor in some of the music. I had two evening rehearsals the week before Christmas with a virtual soundcheck day in between each rehearsal to help get things refined. I haven’t been using many snapshots for most of the stuff I’ve been mixing lately, but they were invaluable for this event. The service wasn’t overly complicated, but there were enough different transitions happening that it was much easier to manage by utilizing snapshots in addition to VCA’s. 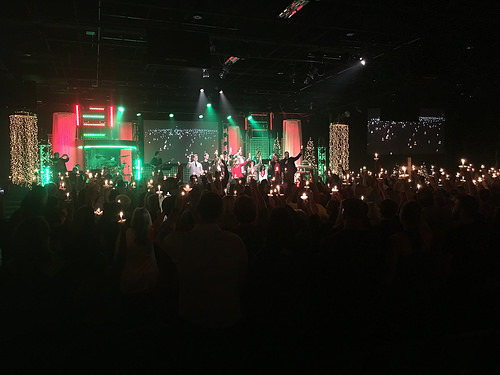 I mixed 5 Christmas services on the weekend before Christmas, 2 services on December 23rd, and 3 services on December 24th for a total of 10 Christmas services. 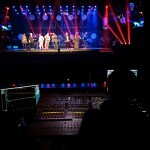 I had a great month in Florida and really enjoyed my time mixing at Christ Fellowship. It was refreshing for me to see that December can be a great time to be a part of a church. Sometimes you just need to change the scenery a bit to figure that out.